Honar: The Afkhami Collection of Modern and Contemporary Iranian Art is an incredible journey through a foreign Middle East world that is, for many Americans, veiled in taboo, fear, and misunderstanding. Honar (meaning “art” in Persian) is, in effect, the language that is able to cross the borders, lift the veil, still the fear, and create common ground. Muhammed Afkhami is the forth generation to continue a deep family art appreciation tradition after his mother (Maryam Massoudi Kashefi), his grandfather (Iranian Senator Mohammed Ali Massoudi), and his great-grandmother (Effat al-Muluk Khwajah Nouri) who actually founded the first all-female art institute in Iran in the 1930s. Afkhami’s penned article draws out the booms and busts of the art world in Tehran with a rock bottom low occurring during the 1979 revolution when people fled in droves to safer havens in Europe and the U.S. This event marked a tectonic shift in the defining characteristics of ancient and isolationist Iranian art from calligraphy, poetry, and religious beliefs, toward a broad internationalization of artistic influences. After the revolution, the line between Iranian art and non-Iranian art became blurred as Iranian-born artists trained and then settled outside of Iran. What is Iranian about artwork created by an artist who may have been born on Iranian soil, but left Tehran during their childhood to be raised in Munich, attend art school in Paris, and settle in New York? Seeking earnestly to answer this incredibly challenging question, each artwork (over 250) and artist (nearly 100) presented in this volume expounds on this theme. Many artists (Ansarinia, Matine-Daftary, Farmanfarmaian, etc. ), though they studied abroad, have returned to Iran to teach or create a gallery. Just as many (Akbari, Aliabadi, Derakshani, etc.) have chosen to remain abroad and share their Iranian experience through their artwork with their adopted homelands. Some (Pilaram, Tabrizi, etc.) abide in traditional techniques, themes and motifs, while others (Shishegaran, Tavakolian, etc.) are pairing the old with a modern spin. Whatever the case, it does not take long to realize that, as massive as this book is (measuring 10 x 14 inches and weighing in at over five pounds) it does not even begin to cover the bulk of artists that comprise the Iranian people or their diaspora. With a varied people spread as far as the world is wide, it would seem a daunting task to hone a general definition of Iranian art or even of Iran itself. In such a case, it is worthy to use art as the defining tool instead of words. A collection of art, to be more precise. 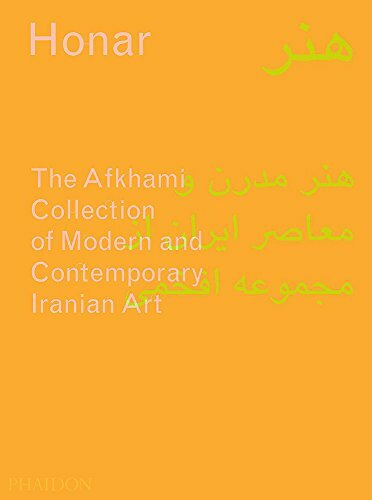 As such, the Afkhami collection greets the world gently with a classical Iranian foundation. It presents a contextual bridge to the complex Iranian political, social, cultural, foreign, unsettling, and confusing fringes. Readers are escorted along the way, from artwork to artwork, toward an understanding of the rich and humanely meaningful world of Iran.